It's been a brutal winter around here. 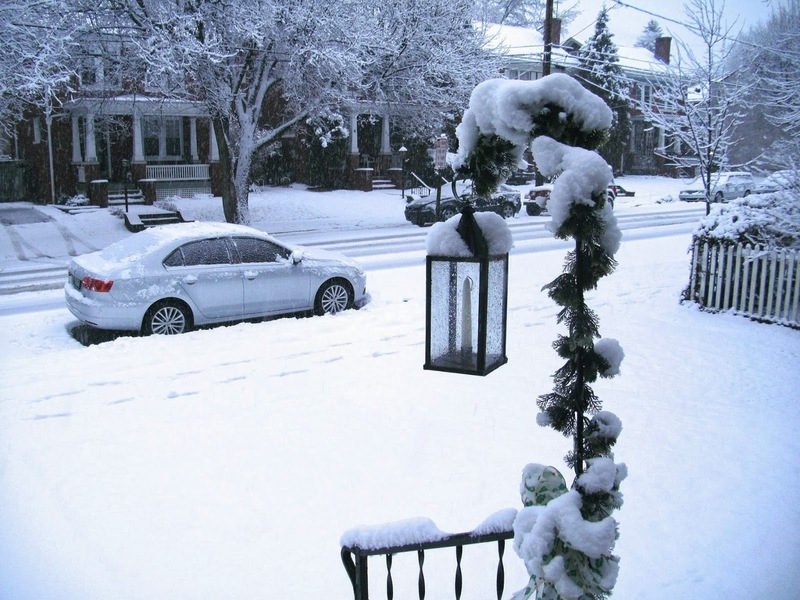 Record breaking cold; steady snow and ice. 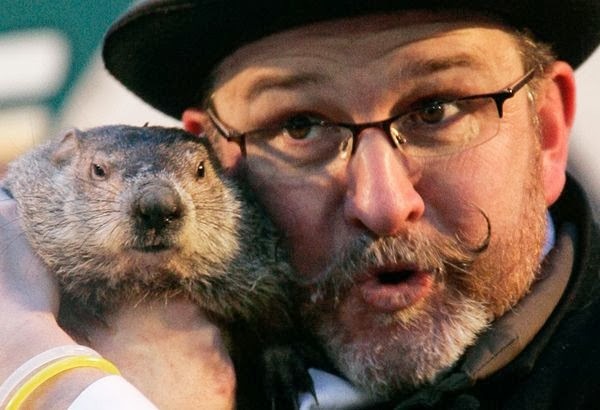 And our own Pennsylvania weather prognosticator, Punxsutawney Phil, just forecast another 6 weeks of this nonsense. We had another brief thaw yesterday, and Dear David headed south to the big model train show near Baltimore, so I decided to start at the flea market and then make the rounds of some antique shops I hadn't visited in a while. There were still patches of snow on the ground at the flea market, and not many vendors had turned out, but I still made some discoveries. 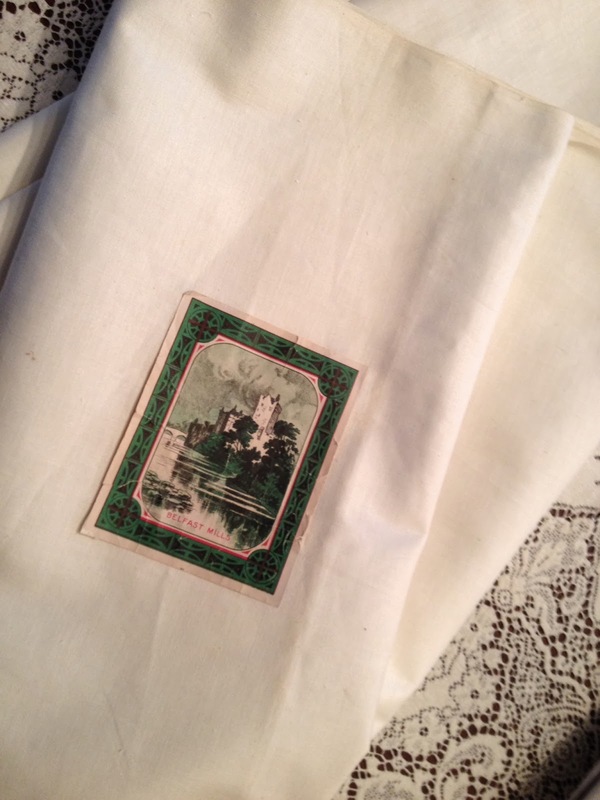 "Guy Who Will Not Bargain" was there and I filled a box with linens, smiled sweetly, and paid up without a quibble (his prices are still good, despite the non-haggling part). But the real discovery of the day was at another vendor. 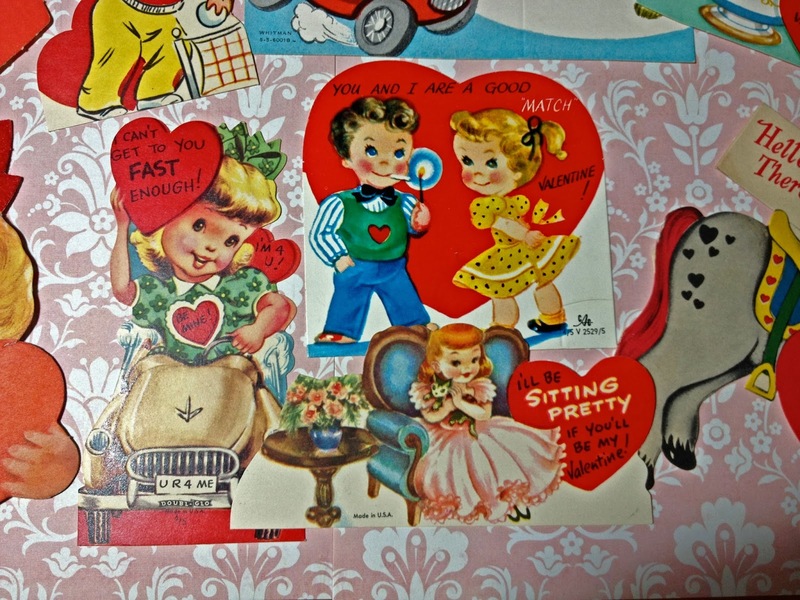 A big ol' stack of vintage greeting cards, including 30 1960s Valentines. The kind we used to give in school to all our classmates. 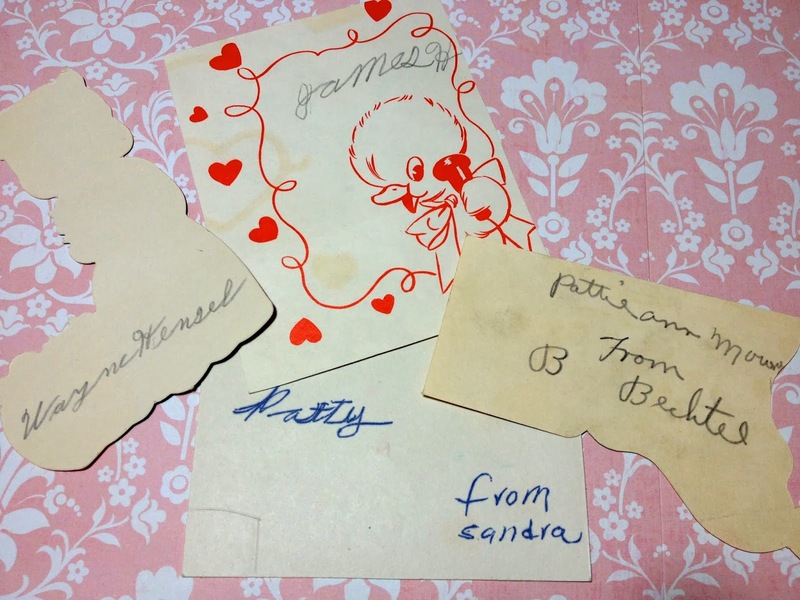 As a re-seller, they would be much more valuable had they been unused, but these had been collected and saved by young Patty Ann Mowrey (or maybe it's Patti Ann--both spellings are represented), who was clearly in elementary school when she received these. They brought back so many memories! 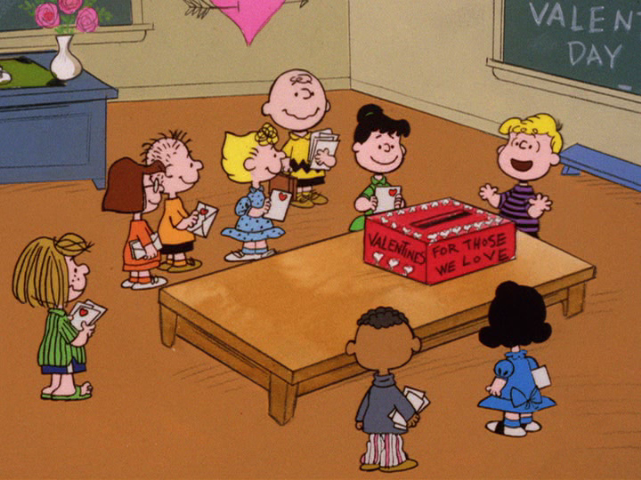 Sometime before Valentine's Day, class time spent decorating an old Kleenex box with pink and red construction paper hearts, and writing your name on it? 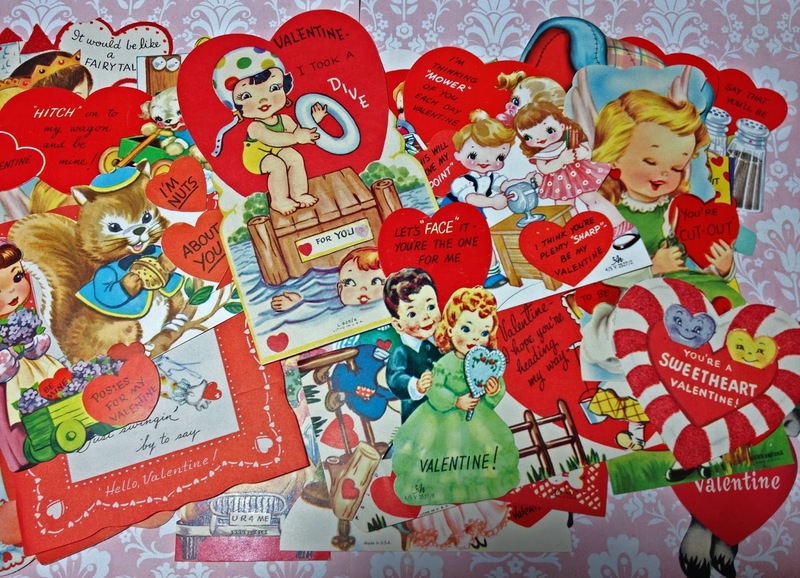 Lining up all the boxes on a back table, ready to receive classmates' Valentine cards? 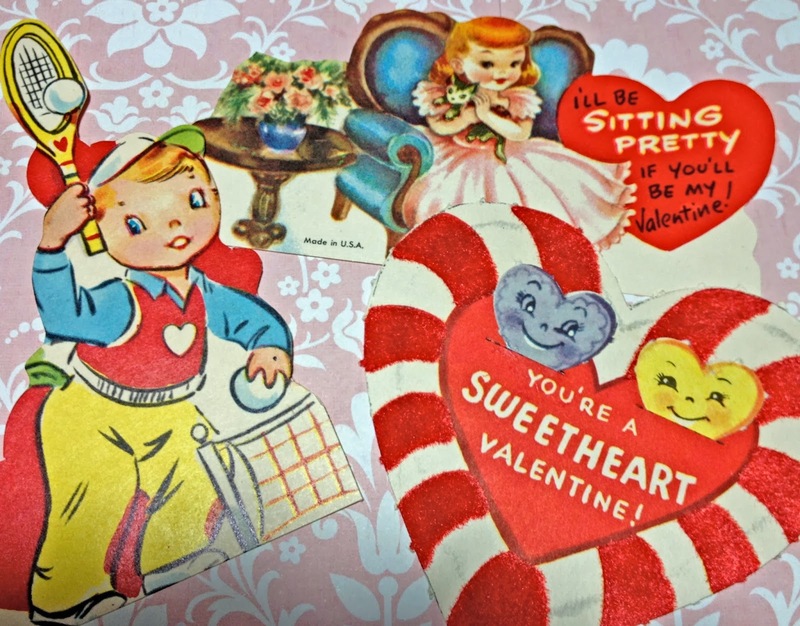 Picking out just the right Valentine for each classmate, making careful distinctions among the messages so your friends got the "good" ones, and the cute boy in the next row got one that was just romantic enough to express your secret feelings--but not TOO mushy. 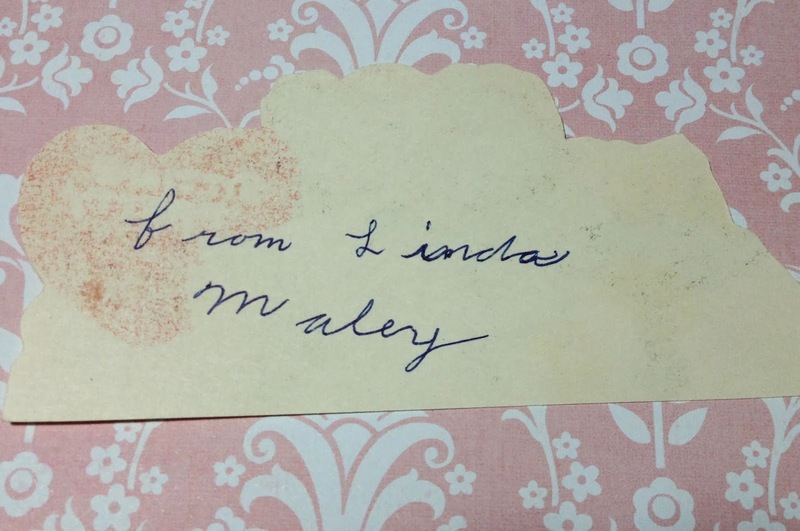 Using your newly learned cursive handwriting? 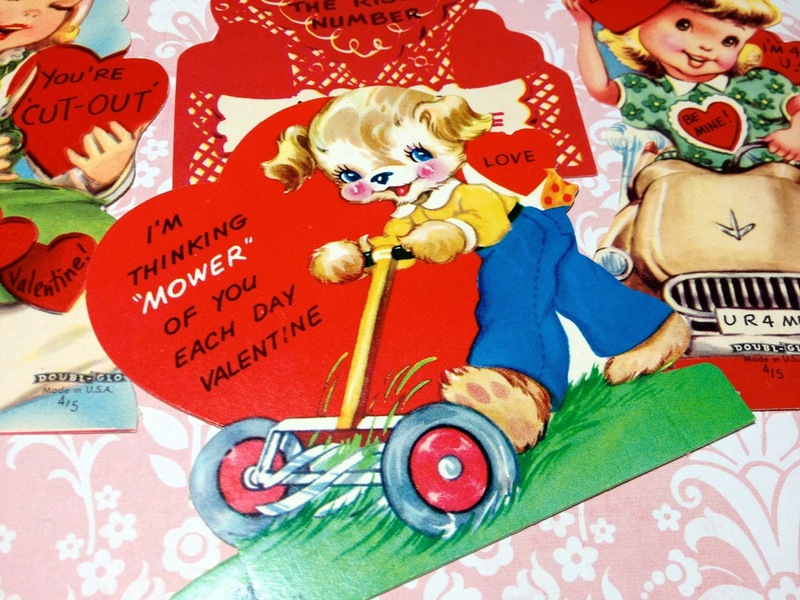 And no matter how hard the teacher tried to keep anyone's feelings from being hurt, there were the kids whose families could afford to buy the more expensive, impressive Valentines. 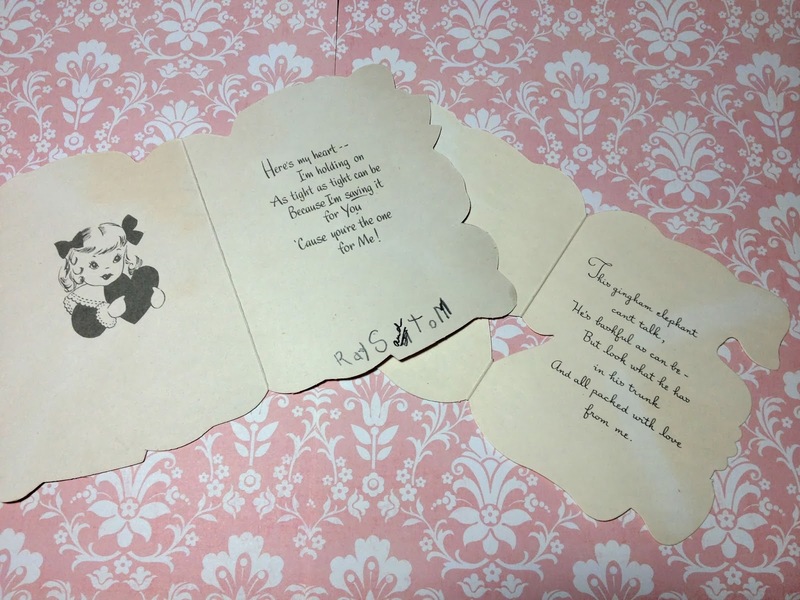 Oh, but the joy of receiving a Valentine from that special boy in the class, and imagining that he meant every word! Fast Forward to today, and I am still in the classroom, but on the other side of the desk, as a teacher. 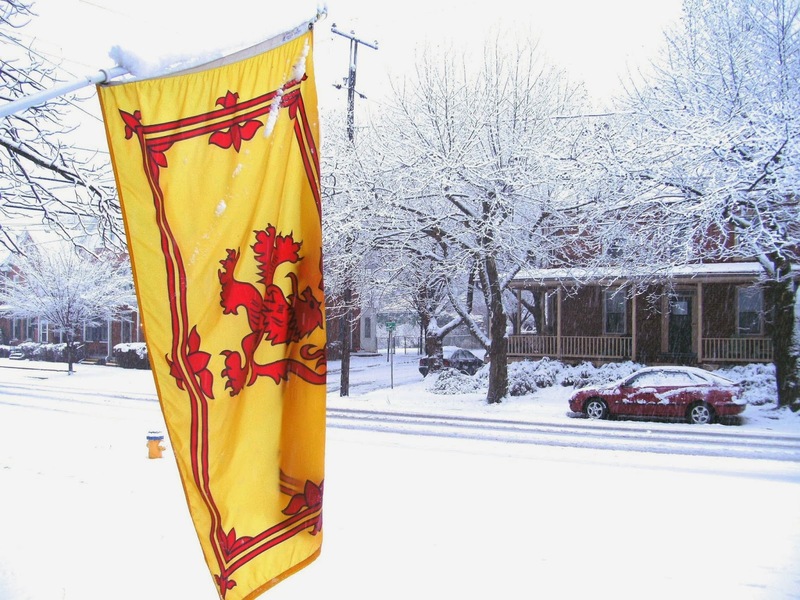 And today this incessant snow and cold has brought us another snow day. A day that will have to be made up by sacrificing another school holiday. At this rate, we may be in school until July! 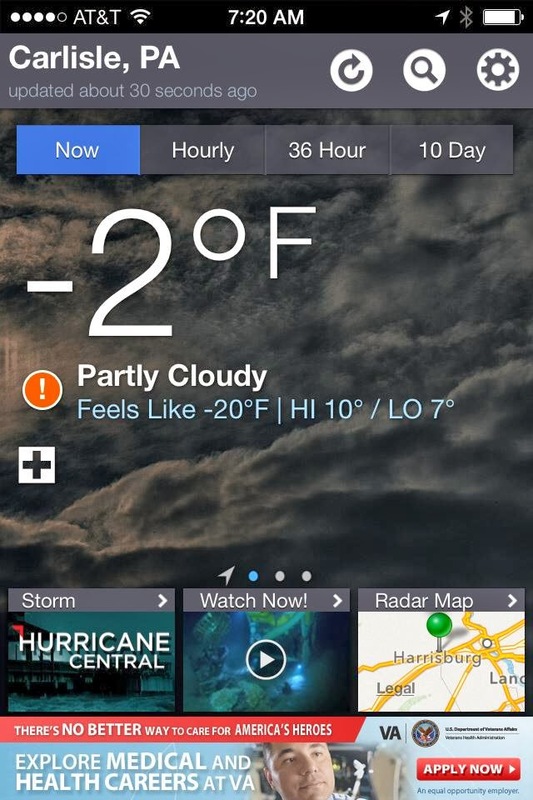 Yeah... the windchill was 20 below. So, this morning, when the temperature was a balmy 38 degrees, I got that flea market feeling again. I'm lucky enough to have a wonderful outdoor flea market that is open all year round (weather permitting, whatever that means). In the winter, you'll still find 30 or 40 vendors set up, many of them selling from auction box lots. So I plied myself with coffee and a hot breakfast (thanks to Dear David), took plenty of cash, and a canvas bag and set out. The usual suspects were there, and you probably have them at your flea market too: The gruff older guy who has great stuff, but absolutely will not haggle. The sketchy guy who is just a little TOO friendly. Lots and lots of guys with tools and 1980s electronics and DVDs. And lots of GOOD stuff! 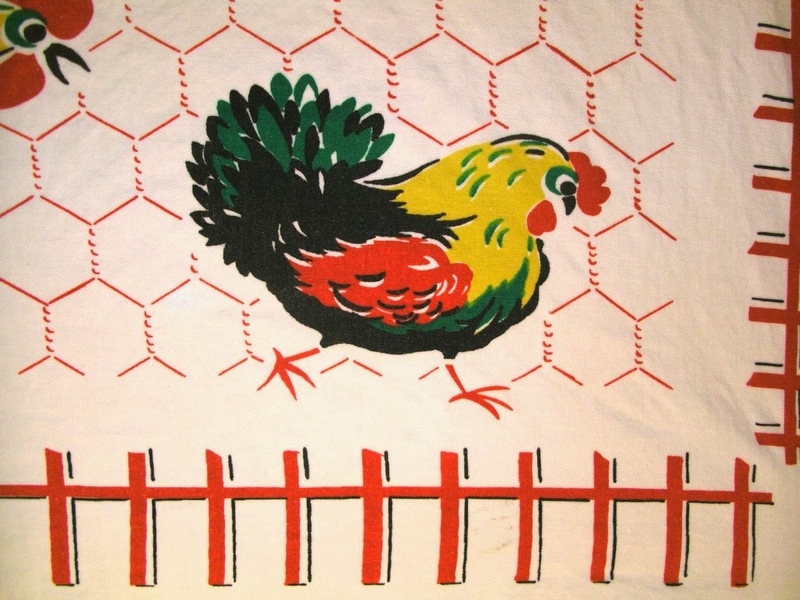 The best stuff came from Guy-Who-Won't-Haggle (of course). 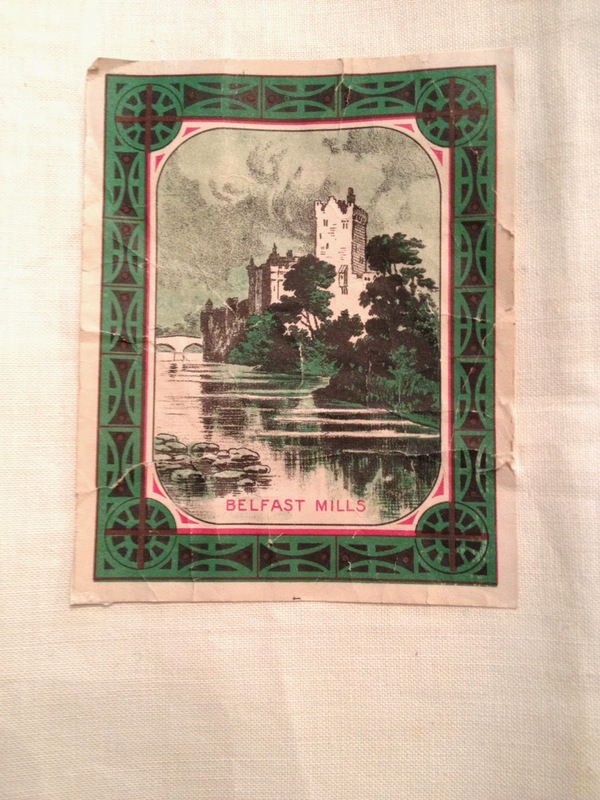 I got nearly 7 yards of Irish linen with the paper label still attached! It's luscious! 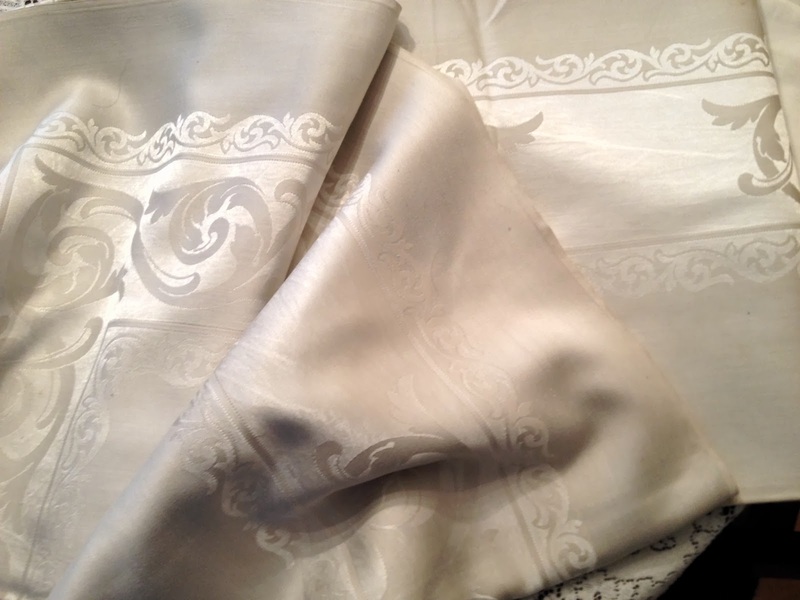 And a completely GI-normous rayon damask tablecloth that I don't think has ever been used! 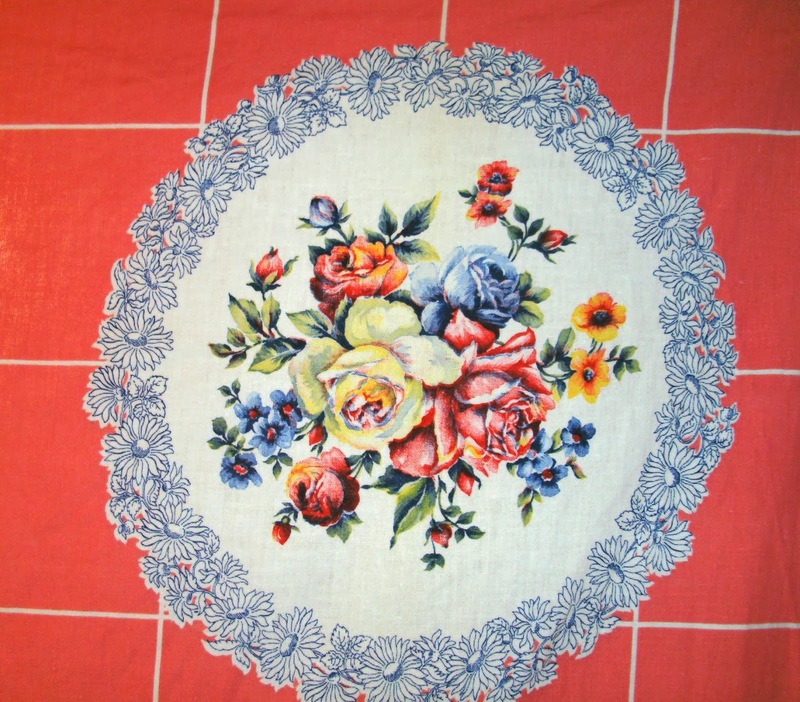 Perfect for a vintage wedding reception head table. 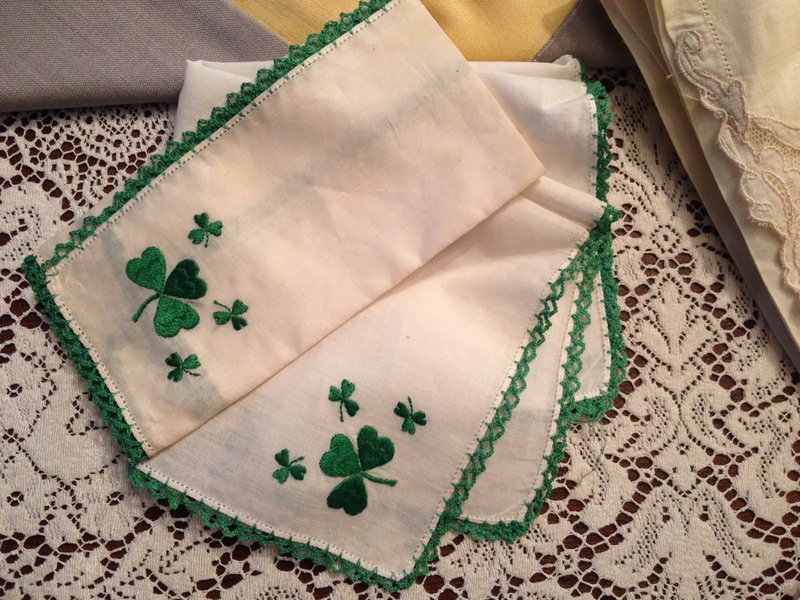 And two sweet little shamrock hankies. 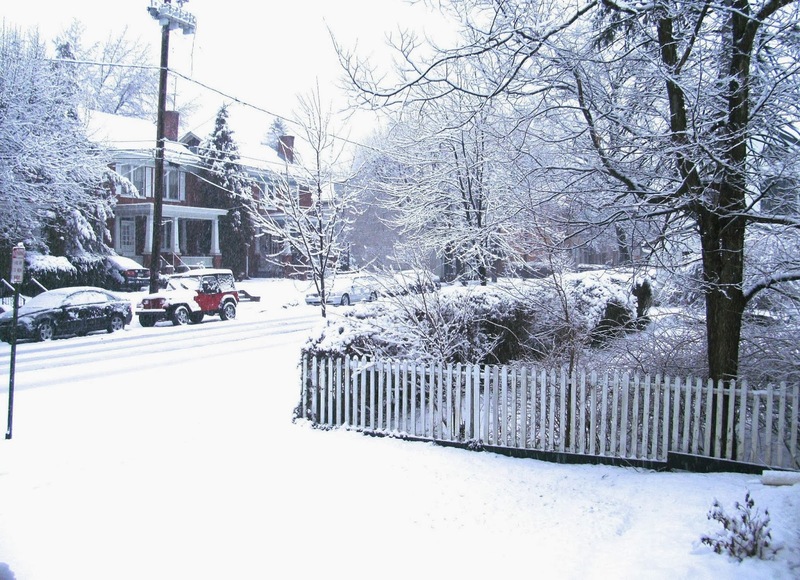 About this time, the cold had begun to set in and (as always), my nose began to run. 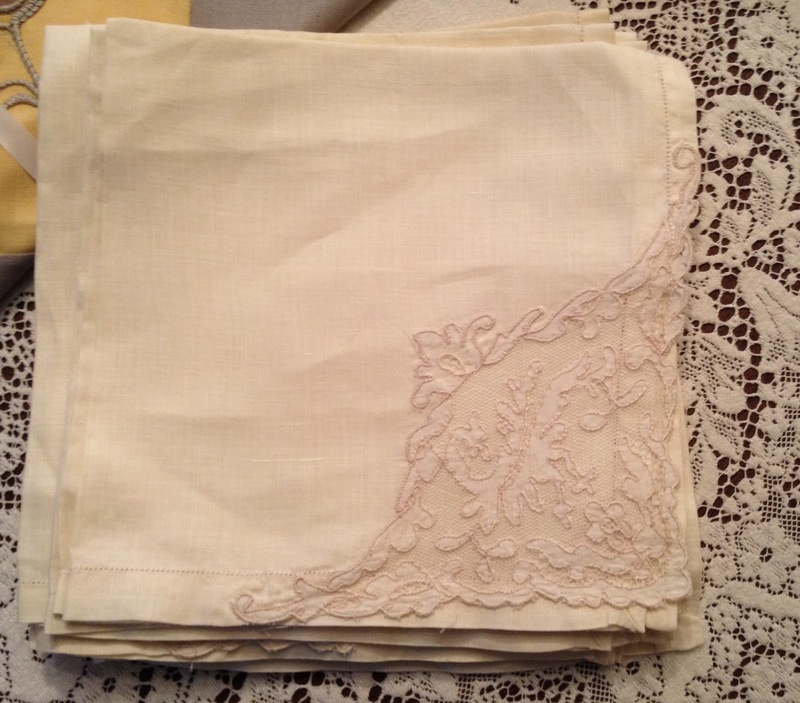 I nearly bought another hankie just to blow my nose on it, but this was Guy-Who-Won't-Haggle, so I decided I could manage a little longer. 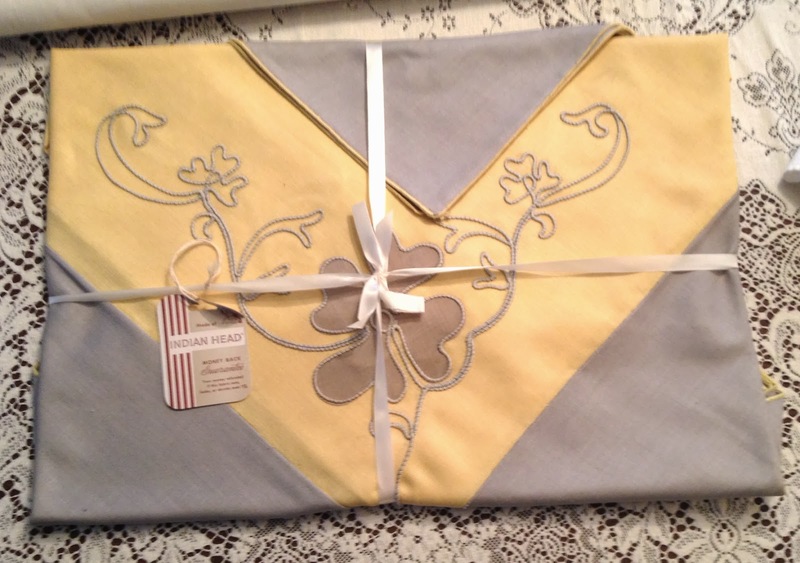 Along the way, I also picked up 8 gorgeous linen napkins, which also appear unused. And a set of four with the paper tags still on them. They have a little bit of a split personality though. 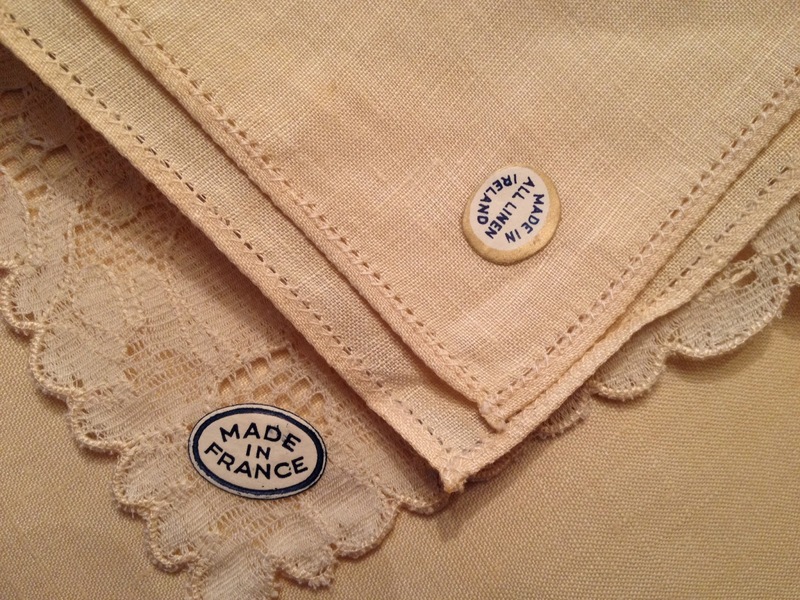 The paper tag on the linen part of the napkins says "All Linen Made in Ireland" and a second paper tag on the back of the lace corner says "Made in France." They are multicultural napkins, I guess. I headed back to the car, where there was Kleenex for my drippy nose, and warmth, and went through my purchases. 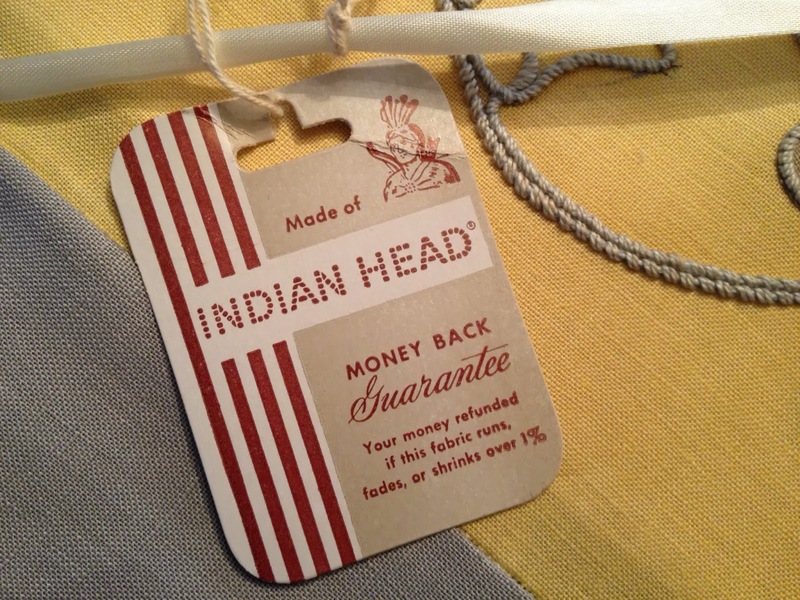 And discovered that the Indian Head tablecloth had only ONE napkin included in the packaging! 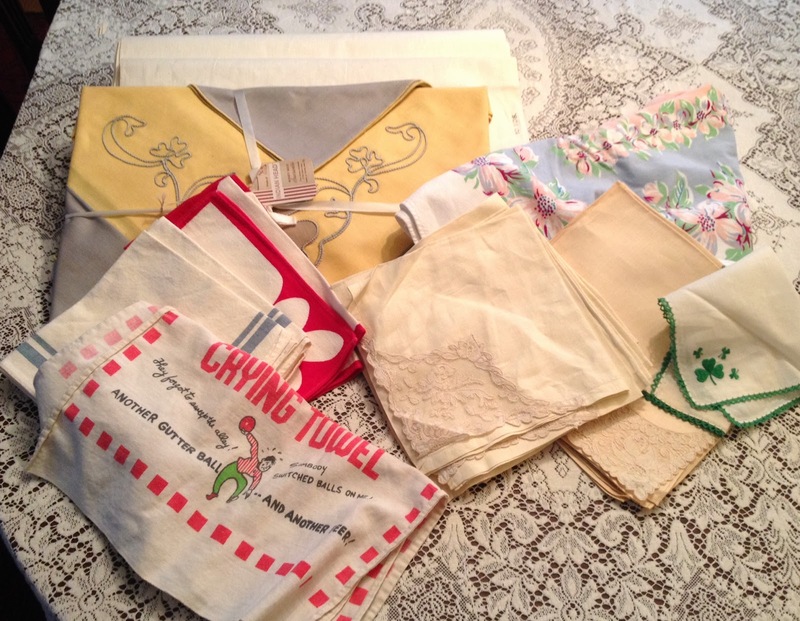 MAYBE I had dislodged the other three napkins when I pulled the package from the bottom of the laundry basket. 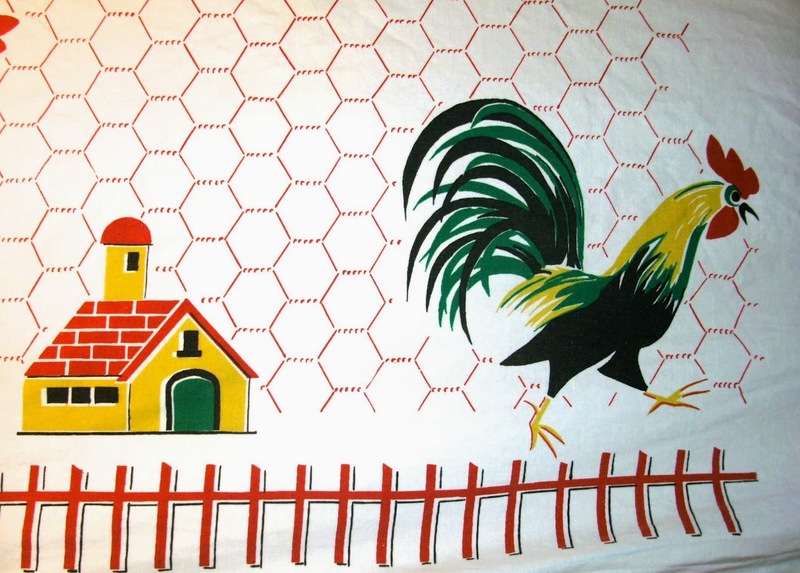 MAYBE they were still there, at the bottom of the basket, on the far side of the flea market. On the other hand, the aforementioned hot coffee had made its way through my system, and a bathroom break would need to come very soon. Flea Market Port a Potty at 38 degrees? 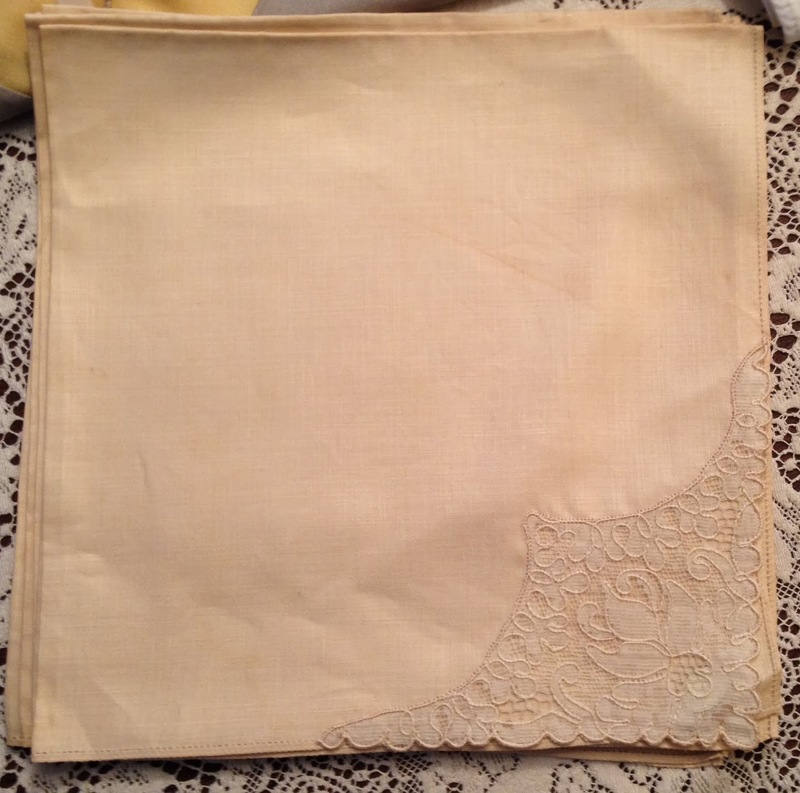 The possibility of 3 additional napkins for this tablecloth? I admit it. I wimped out and drove for home where there was a warm bathroom. What would YOU have done?